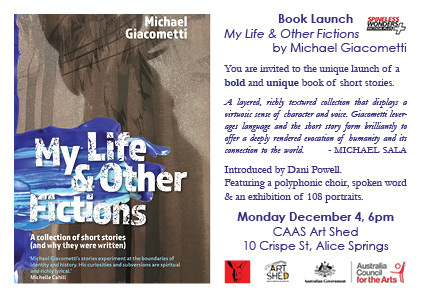 The debut collection of short fiction from Michael Giacometti, My Life & Other Fictions is unique. It is bold, diverse and richly lyrical. It blurs the lines between fiction and non-fiction, fate and desire, identity and history. These are stories for this lifetime … and the next. A unique launch for a bold and unique book of short stories. Featuring a polyphonic choir, spoken word, and an exhibition of 108 portraits. Book sales at the launch by Red Kangaroo Books. Published by Spineless Wonders as part of their Fiction Plus imprint. My Life & Other Fictions – What kind of world is this?